It’s Tuesday again, that means Tuesday Jewelry Tips! Today we will be talking about how to care for your gold. Whether it’s white, rose or yellow gold, certain care should be taken on this lovely metal to ensure that it’s always shining! Karat gold jewelry pieces make up the majority of many fine jewelry collections. Gold comes in many different styles and colors, but the care and cleaning procedure remains the same for all of them. You will often see the terms “karat” or sometimes “carat” used to describe the purity of gold (“carat” is also used to measure the weight of gemstones). You will see it listed as “K” after the parts of gold to parts of alloy. The word “Karat” dates back to ancient times in the Middle East and Mediterranean when carob seeds were used to measure the weight of gold. Gold is the softest metal in the world, when pure, without any alloys added. It is important that the metal be strong and keep its shape, so pure gold is not the ideal metal for making jewelry. This is why gold is often combined with copper, silver or zinc to make it stronger for use in jewelry that we wear. 24k is Pure Gold – nearly 100% Gold. It is extremely rare for jewelry to use just pure gold. In many cases, the gold in your jewelry is mixed with other metals, copper, silver or zinc – the alloy. The percentage of gold to its alloy is what determines its purity. Here in the US, most gold jewelry is either 10K, 14K or 18K. A 10K ring is 10 parts gold to 14 parts alloy – or 41.7% pure. Jewelry that has 14K gold is 14 parts gold to 10 parts alloy, or 58.3% pure. Which would be worth more? If you have two rings of equal weight – one that is 10K and one 14K – the 14K ring would be more valuable, because it has more gold, than alloys added. How do you properly clean Gold jewelry? If your gold jewelry still looks dark, it may need aggressive machine cleaning. Most jewelers have some type of automatic cleaning equipment, such as an ultrasonic, ionic or steam cleaner, and experience using it so they can give you advice about whether such cleaning is safe for your specific piece of gold jewelry. If it is, they can thoroughly clean your gold jewelry for you. The professional ultrasonic machines used in jewelry stores heat the cleaning solution so are more effective than the small ultrasonics sold for home use. You can remove tarnish with jewelry cleaner, or by using soap and water mixed with a few drops of ammonia. Carefully brush with a soft bristle brush. An old toothbrush can also be used. After the brushing, simply rinse with lukewarm water and allow to dry. If there is a heavy tarnish on your jewelry, consult your jeweler for the best cleaning procedure. You should also talk to your jeweler before attempting to clean any karat gold jewelry set with colored gemstones because some stones require special cleaning procedures. Clean gold jewelry that still isn’t looking like new may be scratched and may need polishing to be look shiny once again. 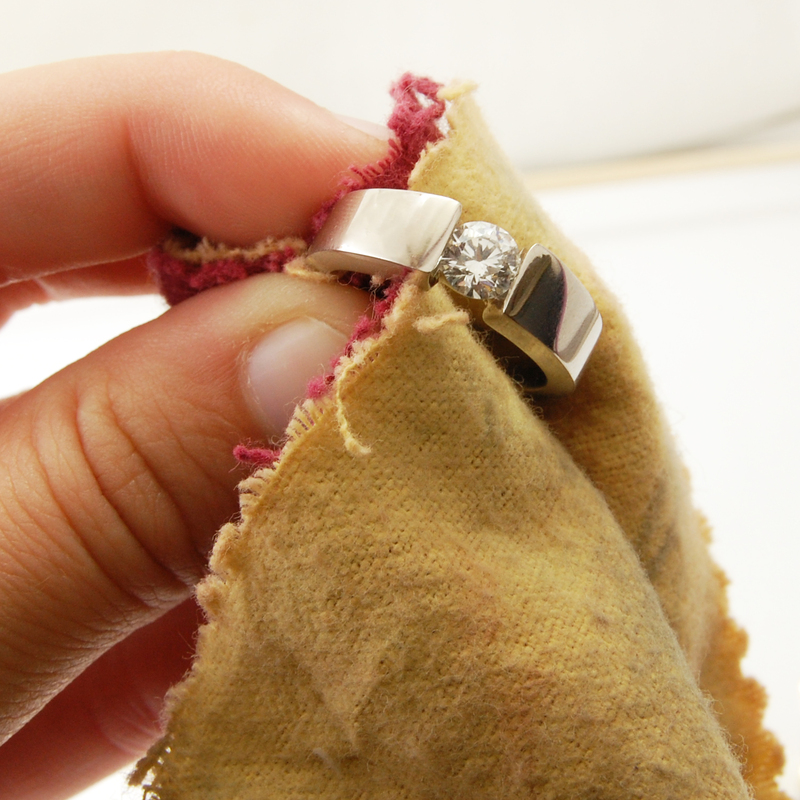 This process is done in stages with abrasive papers, not with a polishing cloth, and is a job for your local jeweler. Such polishing will remove some gold so storing your jewelry carefully will save your gold, and save you some money, too. Before storing, let the gold jewelry lie flat and air dry completely, overnight if possible. Moisture speeds the tarnishing process so it’s important to make sure your gold jewelry is dry before putting it away. Also see my other blog post about jewelry cleaning tips, which I will be going into further detail each week! This entry was posted in Jewelry, Jewelry Guides, Jewelry Tips and tagged cleaning your gold, gold jewelry, jewelry tips, tuesday jewelry tips, tuesday tips. Bookmark the permalink.